A contemporary story of betrayal and new beginnings, A Strange and Separate People is an emotionally rich new play about a young Manhattan couple who find their world shaken when a gay doctor’s passion for his new religious beliefs challenges theirs and questions the meaning of love. 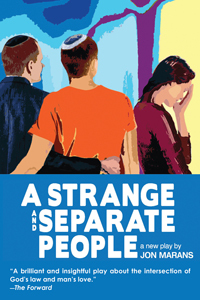 Jon Marans’ play A Strange and Separate People was produced by Daryl Roth and Stacy Shane at the Studio Theater/Theater Row, New York City and the Penguin Repertory Company in Stony Point, NY. Mr. Marans’ play The Temperamentals, also produced by Daryl Roth and Stacy Shane, ran for over eight months Off-Broadway at the Barrow Group Theater and at New World Stages. The Temperamentals was nominated for both the Lucille Lortel and the Outer Critics Circle Award for Outstanding New Off-Broadway play and Mr. Marans was nominated for the John Gassner Award. It was a 2012 American Library Association Stonewall Honor Book in Literature. The entire cast won the Drama Desk Award for Best Ensemble and Michael Urie won the Lucille Lortel Award for Outstanding Lead Actor. Mr. Marans’ play Old Wicked Songs was a Pulitzer Prize Finalist for Drama, included in Otis Guernsey’s Best Plays of 1996-97, and won the New York Drama League Award (including play and both actors) and the L.A. Drama Logue Award. It was first presented by the Walnut Street Theatre, then in New York City by the Barrow Group, and then moving (produced by Daryl Roth and Jeffrey Ash) to the Promenade Theater where it ran for a season. In England, Old Wicked Songs started at the Bristol Old Vic, transferring to London’s West End at the Gielgud Theater starring Bob Hoskins and James Callis. The play has been produced throughout the U.S. and has been translated and produced in over a dozen countries. Other produced shows include the one-act A Girl Scout World (Bloomington Playwrights Project), Jumping for Joy (Laguna Playhouse and the International Adelaide Theater Festival), Legacy of the Dragonslayers (book by Jon Marans, lyrics by Ronnie Gilbert, San Jose Rep), Irrationals (book & lyrics Jon Marans, music by Edward Thomas, Village Theater and ATA, New York City), The Cost of the Erection (Blank Theatre in LA) and A Raw Space (Bristol Riverside Theatre.) In television, Mr. Marans was a writer for Cookin’ in Brooklyn and a writer/lyricist for the 1991 New Carol Burnett Show. In film, Jon Marans and Yuri Sivo were hired by Universal Pictures/Tribeca Productions to write a political/war screenplay based on Roy Rowan’s acclaimed book Chasing the Dragon which takes place in 1947 China, in the middle of their civil war. Mr. Marans is a graduate of Duke University in mathematics and a minor in music. “A brilliant and insightful play about the intersection of God’s law and man’s love. “A Strange and Separate People” is rich in drama and Jewish tradition. The title comes from comments supposedly made by the late Queen Mother, who said she liked the Jews 'very much, but they were a separate people and a strange people' — perhaps in more ways than she ever expected." Clicking on the logos below will take you directly to each vendor’s purchasing page for A Strange And Separate People.